Black Flat Shelf with Lip, 15" x 24"
Chrome Flat Shelf with Lip , 15" x 24"
Black Slant Shelf with Lip , 15" x 24"
White Flat Shelf with Lip, 15" x 24"
Chrome Slant Shelf with Lip , 15" x 24"
White Slant Shelf with Lip , 15" x 24"
Black, Gridwall Flat Wire Shelf , 24" x 24"
Chrome, Gridwall Flat Wire Shelf , 24" x 24"
White, Gridwall Flat Wire Shelf , 24" x 24"
American retail supply have been going to giftshows and conventions with these very gridwall shelves. Place books, maps, and guides on our slanted gridwall shelves. Consider gridwall shelves with lip if you have merchandise that could easily roll off, otherwise, we have gridwall shelves without lip. We have two options for flat and level shelves, acrylic shelves are perfect for any size item while our wire grid shelves are for medium/large products. 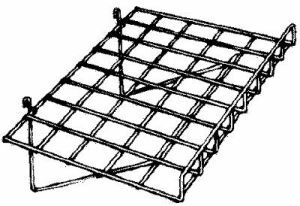 Another type of gridwall shelf that American Retail Supply has is triangle shaped. This one has less room but makes the product on the shelf stand out. The sizes we have for gridwall shelves are either 15 x 24 or 24 x 24 gridwall shelves in black, white, or chrome color. Consider American Retail Supply for your slatgrid and gridwall supplies, as we have been supplying to retail business for many years. Call if you have any questions, 1-800-426-5708.